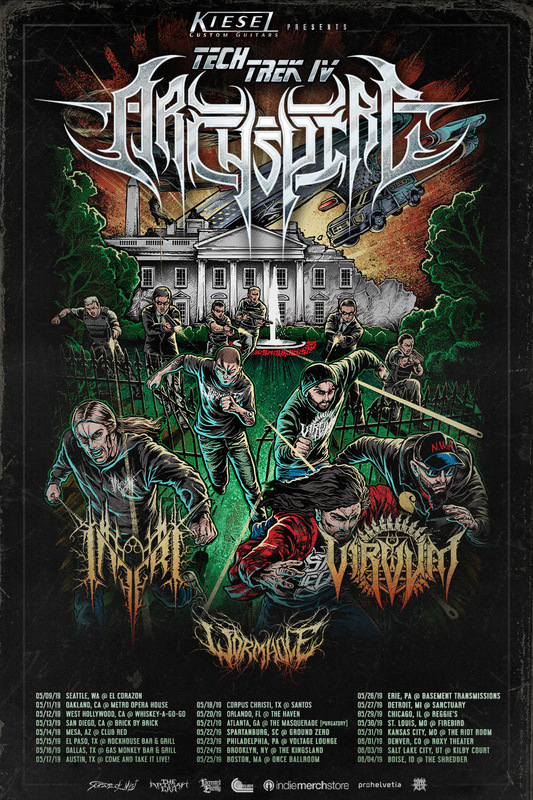 Canadian tech-death metal masters ARCHSPIRE have announced a full North American tour in which they will be supported by label-mates VIRVUM as well as INFERI and WORMHOLE. 'Tech Trek IV,' which is presented by Kiesel Guitars, will kick off on May 9 in Seattle, WA and will conclude on June 4 in Boise, ID. The full itinerary can be found below. In addition to 'Tech trek IV,' ARCHSPIRE will be performing two local dates in British Columbia this March, in which they will be supported by THE HALLOWED CATHARSIS and BLACKWATER BURIAL. Also, ICYMI, ARCHSPIRE have recently premiered a series of videos on "Nail The Mix" via YouTube. The tech masters give fans an inside look at the intricacies that went into developing their latest release, 'Relentless Mutation,' which was mixed and mastered by Dave Otero. To watch the unboxing for the raw-multi tracks of "Remote Tomb Seeker," visit THIS LOCTION. To watch the vocal effect focus clip, which features Dave Otero, visit THIS LOCATION. To hear ARCHSPIRE guitarist Dean Lamb and Dave Otero's joint URM podcast interview, visit THIS LOCATION. Welcome to first class technical death metal madness. Machine gun vocals rattle remorselessly over a furious flurry of arpeggios, scales, and everything else that the two string wizards of ARCHSPIRE can pick at break-finger speed out their guitars. If this sounds hardly human at the level of technical execution, the Gatling-style hyper-drumming pushing these monstrous compositions forward is adding to the alien impression. It cannot even be a question that the Canadians have outdone themselves with their third full-length, 'Relentless Mutation'.